High Quality Content by WIKIPEDIA articles! Rudolph Aloysius Gerken (March 7, 1887 March 2, 1943) was an American prelate of the Roman Catholic Church. He served as Archbishop of Santa Fe from 1933 until his death. 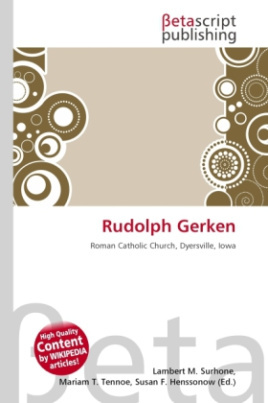 Rudolph Gerken was born in Dyersville, Iowa, as the sixth of the seven children of William and Elizabeth (née Sudmeier) Gerken. However, in 1889, his mother died and William then married Carolina Wuebbelt, with whom he had six more children. Raised on a farm, Gerken studied at Pio Nono College in Milwaukee, Wisconsin, and St. Joseph's College in Rensselaer, Indiana. He moved to Texas, where he taught in Scotland public schools from 1910 to 1912. Gerken later decided, through the encouragement of Bishop Joseph Lynch, to embark on an ecclesiastical career whilst teaching at the University of Dallas; his brother Leo also became a priest. He studied theology at Kenrick Seminary in St. Louis, Missouri, where he also taught languages, before being ordained to the priesthood by Bishop Lynch on June 10, 1917.